I just wanted to take a moment to plug what I regard as the single funniest web comic I have ever encountered--even if it IS three years old, now, from its origins. 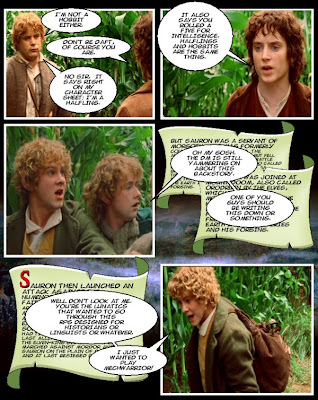 Lord of the Rings is more or less the foundation of modern D&D. The latter arose from the former, although the two are now so estranged that to reunite them would be an act of savage madness. Imagine a gaggle of modern hack-n-slash roleplayers who had somehow never been exposed to the original Tolkien mythos, and then imagine taking those players and trying to introduce them to Tolkien via a D&D campaign. The results, here, cannot truly be described; they can only be experienced. We give it the big two thumbs up.